We set a clear objective in the briefing of our engineers and designers: it was essential to create a new Lotus which reflected the genius of Colin Chapman. It must be light, efficient and fast. With Elise, Lotus has once again set new standards for handling, performance and style, with a unique blend of classic and forward thinking features. It is a real winner, ahead of its time, in true Lotus tradition. 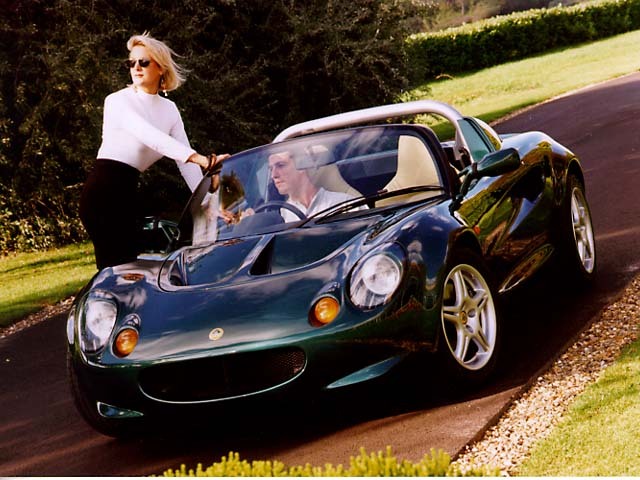 Naturally, Elise features the latest thinking in styling, aerodynamics and ride, yet it is a true Lotus. Its ultra-light design is intended to meet all world-wide requirements for safety, comfort and emission and noise control. Its stunning lines have been penned by our in-house stylists who have justly earned respect as world leaders. The appeal of this model is not limited to its aesthetics. Throughout the project I have been delighted by the Lotus engineers' dedication and innovation in achieving a lightweight vehicle. They have applied simplicity and purity of design with technologies of the future such as extrusions in a bonded aluminium chassis and components. The powertrain has class leading low weight and options including a full race version are planned. The result is an advanced race bred high-performance sports car with distinctive new styling which delivers the most fun on four wheels. In short, it is a winner for Lotus, which was created not only with great expertise but with great passion. It is for this reason that I chose to name it after the great love of my life who came into this world at the same time, my grand daughter... Elise. All Lotus design, lightweight spaceframe of bonded anodised extruded aluminum with integral roll over hoop, extruded aluminium impact absorbing structures and steel galvanised rear subframe, manufactured by Hydro Aluminium Automotive Structures a.s. Seating for two. Composite front and rear 'clamshell' body sections with frontal safety structure. Mid-mounted in-line water cooled 1.8 litre 16 Valve engine. Double overhead camshafts with hydraulic tappets. 5 speed transaxle driving the rear wheels. Synchro on all forward gears. Fuel tank capacity: 40 litres (8.8 gallon). Fuel requirement: 95 RON minimum octane unleaded. Independent by upper and lower wishbones, co-axial coil springs and inverted monotube dampers. Extruded aluminium uprights. Trailing toe-links on rear for compliance steer control. 282mm aluminium/metal matrix ventilated discs mounted outboard front and rear. Non-servo split circuit hydraulic system. Front brakes fitted with unique Lotus/AP Racing opposed piston callipers. 5 1/2J x 15 front and 7J x 16 rear. Front: 185/55R 15 Rear: 205/50R 16. Acceleration: 0-100 km/h: 5.9 s.
Alloy wheels, 3 way catalytic converter, coded signal immobiliser, cloth trim interior, black vinyl soft-top, uniqy Lotus/Nardi steering wheel, STACK electronic speedo and tacho with multifunction LCD readout. Metallic paint, leather trim options, radio fixing kit, spare wheel/tyre assembly, auxiliary lights, Lotus design luggage kit, coloured and black cloth soft- top, full race packages, floor mats. Elise is covered by a twelve month unlimited mileage factory warranty. See the Lotus Gallery for more photographs.